I’ll keep this short because Burke and Hare doesn’t have a lot to be said about it. Pegg and Serkis make an interesting pair in the title roles and had some chemistry but they are left to carry the film. Fisher and Hynes aren’t bad as the respective character’s love interest and wife. Unfortunately their four character are given the job of carrying the lumbering weight of the film. As a whole Burke and Hare felt underdeveloped. It’s as though they had an OK script and wanted to get it out for Halloween. So rather than fixing the script they filled it with one scene cameos in the hope of distracting the audience. Unfortunately completely undeveloped cameo characters can’t disguise the problem. They added nothing to the story and most failed to be funny into the bargain. Paul Whitehouse has the one cameo that really does anything and shows what could have been if half of the others had a similar chance to make an impression. Sadly even larger parts were equally undeveloped – Ronnie Corbett’s Captain McLintock could and should have had some meat on its bones but was distinguished only for being a bit incompetent and a bit short. Similarly Curry, Wilkinson, Bonneville, Schofield and others were just not given anything to work with. After reading a couple of reviews I’d been worried it was going to go for gross out comedy. It’s not a style I’m a huge fan of but it could fit the historical Burke and Hare. Unfortunately they failed in that department as much as they failed at being funny in any other way. It ends up being a mildly amusing diversion. The one thing I’d say in defence of the film is any reviewer who complains about historical accuracy needs to check the disclaimer they put at the start of the film. It never claims to be anything but a work of fiction – if it had been hilarious one bad accent and various anachronisms would have been overlooked and everyone would be congratulating John Landis, the cast and crew for a job well done. 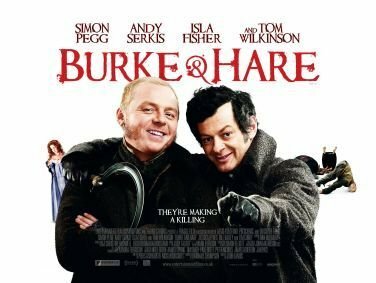 Burke and Hare is not a bad nights entertainment but not one I’d recommend or really think about picking up if the DVD was going for £3.